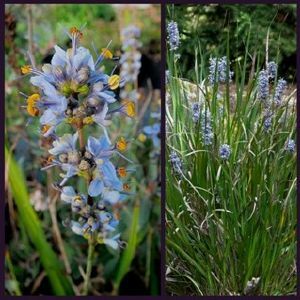 Libertia caerulescens (caerulea) is an unusual and rare evergreen perennial with pale green, upright, linear foliage. In the spring, stems of pale blue flowers appear. Suited to planting in mixed herbaceous borders, scree gardens, or in containers. Evergreen. Native to Chile. Libertia is a genus of monocotyledenous plants in the family Iridaceae containing 15 species in the southern hemisphere. A number of species are endemic to New Zealand. They are all perennials growing from short woody rhizomes, with simple, linear or narrowly lanceolate basal leaves which are often green but may be red or yellow depending on the species. The showy white trimerous flowers are open in spring and are followed by capsules opening by three valves which contain the numerous black seeds. The genus was named after Anne-Marie Libert (1782–1865), a Belgian botanist.